Teaching an Old Dog New Tricks: Pokemon Go or Pokemon Stop and Stare? Pokemon Go or Pokemon Stop and Stare? Like everyone else I have started to play Pokemon Go! 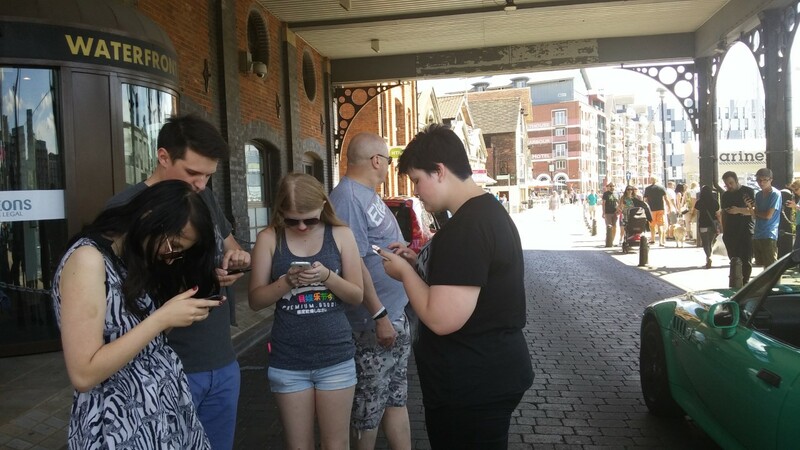 This was the scene today at the beautiful Ipswich Waterfront, where, instead of people strolling around enjoying the lovely sunshine and looking at expensive yachts, they were all clustered around staring at their phones waiting for Pokemon to pop up! At least it gets teenagers such as Libby out of their bedrooms and away from the computer! It also is something she can do with her older brother and cousins. We also had another walk later to the local Library ( a pokestop) where someone had set up a lure and there were around 6 or 7 cars full of young people sitting and chatting together.